This past week we were enjoying some steak for shabbos, so I reached for for two wines that I thought would go well with a hunk of meat. I have been talking a bit about the state of israeli wines and their over ripe wine drunken stupor. Yes, I have clearly moved from the sweet, bold, 2×4 wines of old, but the good news is that there are wines from before 2009 that continue to age well and show well. So, it was time to see how the 2006 Yarden Cabernet Sauvignon was showing. I also wanted to see where the 2010 Herzog Petite Sirah, Prince Vineyard. Last week, the Herzog PS2 was DOA. I stated there that PS is one of those finicky wines, they can be big, burly, and in your face one day and DEAD the next. We have spoken about Durif before, yes the official name of Petite Sirah. Petite Sirah is a moniker/marketing scheme name that was used in the US, as Durif made no sense, and also because some thought it was related to the Syrah grape, at least until UC Davis disproved that. We have had two vertical tastings of PS, here and here, and each time we find it not an overly complex wine, but one that is very enjoyable. With the release of Recanati’s PS and Hajdu’s PS, along with Ella Valley as well, I have found that you can find complex in the world of PS. The grape was always a blending grape adding mad tannin, color, and mineral (in some cases) to a blend. However, it is a soft and accessible wine if created for the mass market, like Dalton and other do. Still, I would not hold on to these wines for too long, even the complex one, because you are just asking for trouble. They tend to fall off the cliff very quickly, depending on the grape quality, vintage, and length of time held. That said, after 5 to 6 years for the top line wines, at least the kosher ones, I would drink them up. The 2006 Cabernet Sauvignon from Yarden was sweet, that is undeniable, but its complexity, structure, and overall balance made for a wine that was truly enjoyable. 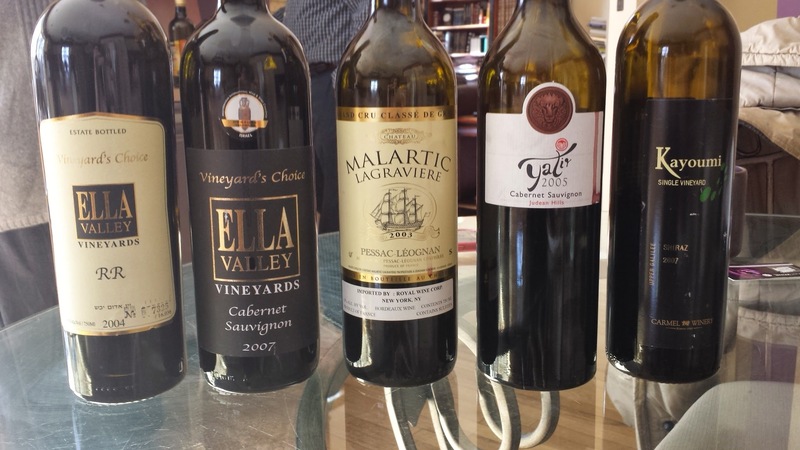 The Ella Valley Syrah were beyond enjoyable! Not a sense of sweet notes at all, the 2007 even had barnyard on it. Sure, it was breaking down, but it was luscious and rich, while the 2006 was beautiful, extracted, blue and black and crazy earth. If you have either – drink NOW! Enjoy! The wines this week were all winners – I hope you enjoyed great wines as well. This wine is at peak so drink NOW! The nose on this dark purple colored wine has ZERO bricking – but has brown halos, with rich tar, licorice, spice, sweet wood, and roasted herb. The mouth on this full bodied wine is massive, rich, concentrated, and richly extracted, showing lovely blackberry, plum, dark tart cherry, along with crazy roasted herb, sweet cedar, and lovely tannin that are well integrated. The finish is long and spicy, with leather, hints of barnyard, black pepper, citrus pith, and tart black fruit on the long linger. This wine was ready to go out of the bottle and what a joy! Bravo to Doron! The nose on this garnet colored wine is rich with crazy roasted animal, tar, mad charcoal, blueberry, and lovely just smoked dark chocolate. The full bodied wine is rich, layered, and extracted with lovely mouth coating tannins that are still gripping, along with anise, blackberry, mint, and with crazy earth, literally like eating a fist full of dirt, and dark cherry that carries the mouth, with layers of Mediterranean herbs and sweet spices. The finish is long and charcoal and chocolate, with mounds of dirt, great acid, licorice, and mad spice. What a joy! This wine is at peak and has at least another year or two in its tank – BRAVO DORON!!!!! This wine is not going to sneak up on you – it is more like a combination of a sledge hammer and a two-by-four hitting you right between your eyes. The nose on this massive, complex styled wine explodes with super ripe blackberry, raspberry, chocolate, herbs, rich oak, licorice, plum, tobacco, and sweet cedar. The mouth on this massive full bodied wine is now showing softly integrating tannins that give the wine a super lovely mouth feel, along with clear sweet fruit, ripe sweet black plum, but tart fruit as well that balances out the date notes. The dates give way to sweet cedar and good acid. The finish is super long and spicy, with nice spice, cassis, date, oak, chocolate, tobacco, and still gripping tannins. The wine is at its peak and is really ready to drink. It still needs a bit of air, but I do not see this wine lasting for another year in this state. The nose started off nicely with good floral and violet notes, along with blueberry ribbons, smoky aromas, mint, green notes of bell pepper. The mouth is medium in body with layers of concentrated strawberry notes, dark cherry, and spiced plum, all wrapped up in a cedar box with lovely mouth coating tannin and anise. The finish is long with smokey notes, vanilla, white pepper, oriental spice, licorice, and mineral. The wine was in slumber before, but now it is ready to go. Air it for an hour an enjoy.